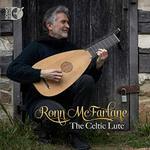 For over 40 years Ronn McFarlane has devoted his career to the magical beauty of the Celtic lute. A founding member of The Baltimore Consort, the West Virginia native taps into his own ancestry…we experience his own poetic disquisition. “The Celtic Lute” is Mr. McFarlane’s watershed moment: we turn back to the 1700s and The Balcarres Lute Book, the source of structure for this new album and the first recording for him in over a decade…all selections have been personally arranged. Drawing from a prolific repertory of Scottish tunes [for lute], Irish tunes had a different dimension: they’re the musical antithesis since no repository for lute existed. For that counterbalance, Ronn McFarlane ventured into the land of blind harpist Turlough O’Carolan (1670-1738) and his 200+ planxtys writings for inspiration. “Emphasized expression makes exercised impression.” Ronn McFarlane has the strength of heart, knows the beat of the Celtic soul, both past and present. This spotless Sono Luminus recording is a coruscating delight.